I recall that as a kid, the best part about any given episode of Columbo was waiting and watching the guaranteed demise of the murderer at the hands of the glass-eyed Lieutenant’s tedious questioning, which invariably contained the famous “one more thing” refrain. Watching these episodes in clear DVD transfer, I am pleased to report the same enjoyment. Watching the murder being meticulously executed, then the murderer being even more meticulously questioned and investigated (so an inversion of the “whodunit”) is the biggest drawcard I could find in the show. The second-biggest would have to be the infectious Peter Falk and his screen presence. The slurry speech, the eye, the dishevelled trench coat… ah, what else can you ask for? The show also featured a long string of special guest stars… some whom we’d have no hope of recognising, and others whose names ring familiar: Martin Sheen, for example. I can’t really think of what else to talk about. As should be obvious, I’m gushing in admiration. I love this show and others who do will no doubt already have the DVDs. That only leaves the people who have very little idea about the show. Take your standard CSI or Law & Order. Remove the high-tech nerve-centre with its swishy young professionals who type away and experiment with reconstructing the crime-scene. You have a middle-aged, shabby, note-pad carrying Lt who mumbles and stumbles his way through each case. 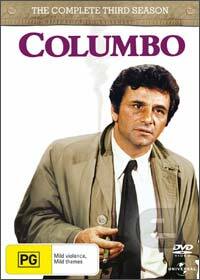 His sharp mind solves the cases by scrutinising minutely the many inconsistencies the suspects are lulled into confessing during one of Columbo’s numerous, seemingly sporadic visits. Okay, done. Hopefully that convinced you. If not… we’ll agree to disagree!